How to Make a Doorbell Circuit for Deaf People? Doorbell circuit for deaf people. When a deaf person is alone in a house, it would be very difficult to realize that someone is knocking on the door without any visual warning signal. 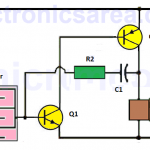 This circuit is connected to a doorbell system that works with direct current (DC) as shown in the diagram, where the actual sound signal is a buzzer. The main component for the Doorbell circuit for the deaf people is the CMOS 4001 integrated circuit, which has four two input NOR gates. 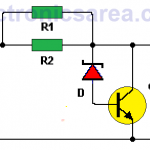 IC1 gate, capacitor C1 and resistor R3 form an oscillator. 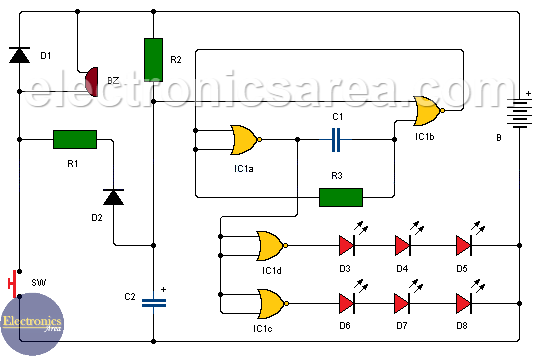 This oscillator is enabled when the IC1b gate has a high voltage level at one of its inputs. 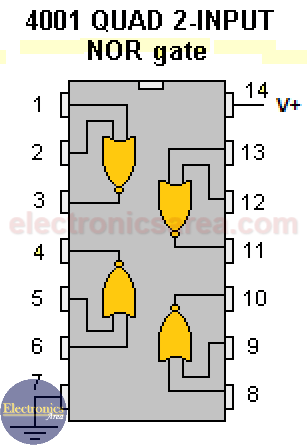 The “enable” signal for IC1b is a low voltage level at the junction point of capacitor C2 and resistor R2. Every time a visitor presses the momentary contact switch SW, capacitor C2 is discharged through diode D2 and resistor R1. It is at this time that the signal that enables the oscillator is obtained. When the oscillator is running, IC1a output goes from high to low continuously for a time that depends on the values of R2 and C2. 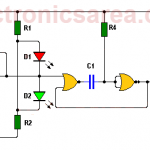 The IC1a output signal is sent to the two inputs of each of the gates IC1C and IC1D, which are wire as a two-input NAND gate. IC1C and IC1D have, at their outputs, the voltage levels that turn ON and OFF the LEDs that visually notified that a person is knocking at the door. LEDs will blink for about 20 seconds, that means the visual signal will be active for much longer than the sound of the buzzer. If you want to increase or decrease the time of activation of the LEDs, you can change the values of R2 and C2. The doorbell for deaf circuit is powered by a 9 volt battery. It can also operate with a supply voltage of 9 volts connected to the network (110/220VAC). This circuit has a negligible consumption when it is not active. How to Make a Current Flow Indicator? How to Make a Car Temperature Alarm using 741 and 555 ICs?